Learn the Art of Dice Control From the Expert! The class will be from 9 AM – 5 PM and will focus on your "On-Axis Toss." Your toss will be observed, tuned-up, tweaked and perfected. It will be all hands on — no boring lectures! Everyone will have plenty of time to work on their toss under Howard's supervision. We will practice tossing from stick left, stick right, and straight out. 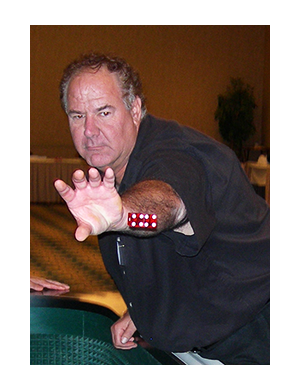 Then, after lunch, I will introduce and demonstrate, and teach some alternate tosses to help you win in the casinos. We will also go over betting techniques (including playing the "Do" side and the "Don't" side), table etiquette, set, grip, and landing zone, and money management. In the afternoon, we'll focus on the alternate tosses. You will learn effective new tosses to help you become a stronger shooter. You will be able to play on all tables, and shoot from different positions with confidence. Some of the alternate tosses include: "The Corner Toss", "Ice Tong Toss", "Split Shot", the "Yuri Low Roll" (with a new and improved grip) and others. This will be a great workshop for those who want to be able to shoot from various positions on the craps table. Sometimes the casino gets crowded, and wouldn't it be great to know that you have an effective toss from almost anywhere on the table? Plus, some of these alternate tosses work on bouncy padded tables too. The full day of instruction, plus playing 2-3 casino sessions (with Howard supervising) on Sunday, is only $599 for first time students. Alumni students who have taken my class before will be receiving a $100 discount making the price $499. Come join the fun in Atlantic City with Howard Rock 'n' roller! Register now! Feel free to ask me any questions. You can write to me at Howardrocknroller@gmail.com or call 954-599-8648.